The goal of modern development has created a clear separation between agricultural and industrial activities, between human and nature, between fluid and solid territories, which become a threat to human living. As we move forwards and slowly detach from nature, we neglect the power of it and forget how we once live with it. Ayutthaya is the city which illustrates such on-going situation clearly, from the day when water was city’s breath to the day when water become city’s catastrophe to local economy, society and environment. In planning for the prospect Ayutthaya we shall try to understand the formation of crisis, in order to determine the new balance between water, Ayutthaya living and Chao Phraya river basin. Back in the 1350s, Ayutthaya was the capital city of Thailand and truly called the water city. Since the beginning of the era Ayutthaya always flood during the rainy season. People learn to live and adapt with the water. 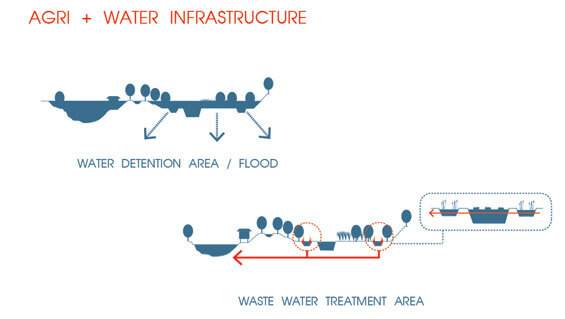 The benefits of the water cause people to change the way they live including their economic and cultural activities to connect with the water. The evolution of the city cause Ayutthaya to developed in the wrong direction. 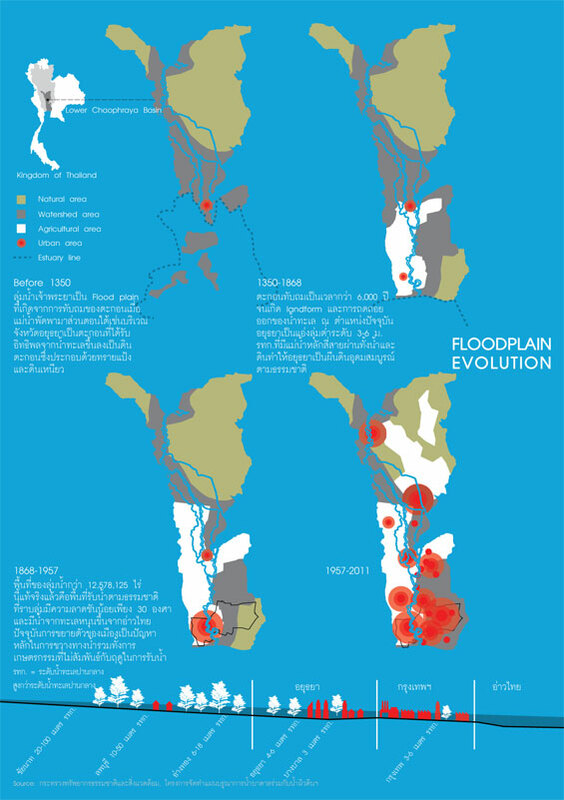 The influence of green revolution in 1967 (which allow farmer to use irrigation instead of natural water source) and economic development direction caused the development that set Ayutthaya’s fluid and solid territories apart. The main idea is to look at nature not just a resource but a natural capital that needs to be maintained as much as physical or human capital. 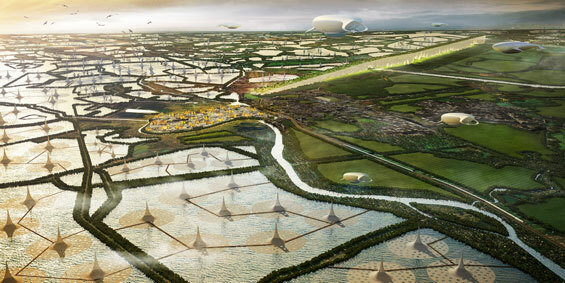 In the context of Ayutthaya, we need to look at the abundance of water not a threat but an economic opportunity. All agricultural area is the main key to the effective water management for Ayutthaya and Chao Phraya river basin. 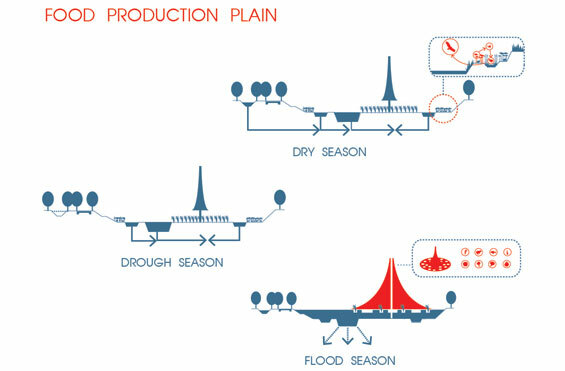 Through extending the potential of flood plain characteristic and the existing irrigation system (which covers 70% of area), the elements are transformed into the “water detention network system”. Moving from separation between industry and agriculture, between human and nature, between fluid and solid territories, towards the new development on the same level field where agriculture and industry assist one another, driven by water-related activities 1,255,629 rai of agricultural land or 78% of Ayutthaya total area are transformed to agricultural++ land to perform not only rice production but also fulfill and enhance every dimension of the city and prepare it for the future challenge. 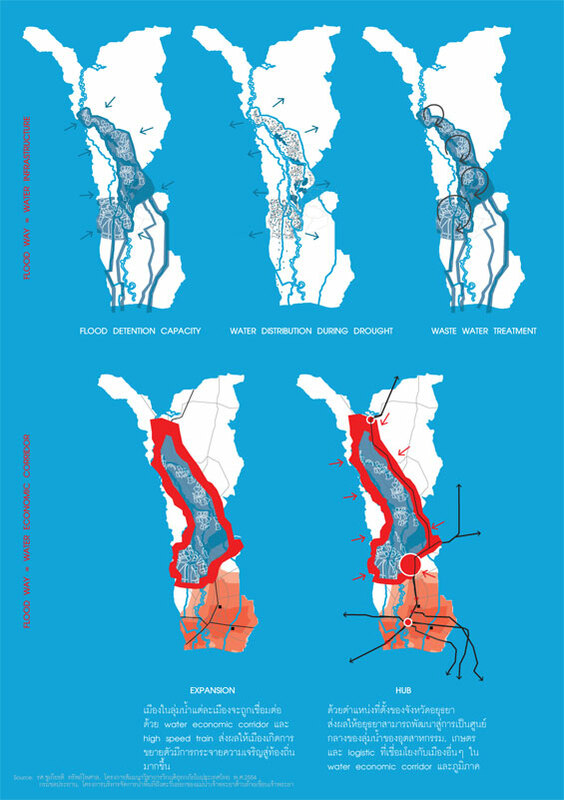 Agriculture + Water Infrastructure | Rearrange Ayutthaya land typography in managing flood, waste water and drought of Chao Phraya Flood plain. Agriculture + Energy & Waste Exchange | becoming self-sustain province, Ayutthaya will harvest energy from their own agriculture waste. 2. Agriculture + Food: In order to convert agricultural land into water detention area during the flood season, farming practice has to be adjusted. The current practice of In-Season Rice Field should be no longer encouraged since this method has an overlap season with the flood. During the flood season, the land are still being use to grow rice, thus, cannot be used to store water. On the other hand, another method of farming called Double-Cropped Field will leave these lands open for water detention. 3. Agriculture + Energy & Waste Exchange: Organic waste of agricultural lands in Ayutthaya is capable for creating electricity for the local area by Gasification process that will convert waste into electricity without releasing any CO2(research in biomass). Electricity generated is sufficient to be used by everyone and even left over for trade. 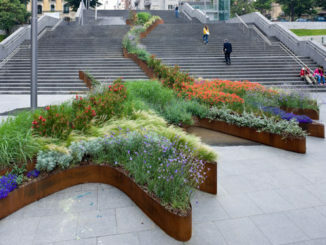 The waste from urban area can composting and transform into fertilizer. Recycled waste from factories can be used to build polder in agricultural area, by Landfill. These exchanges of benefits will strengthen the relationship between agricultural and industrial sectors. 4. Agriculture + Industry: Creating an economic corridor connecting North to South, Dwai(Myanma) to Kanchanaburi(Thailand) and Bangkok to Ho Chi Min City(Vietnam). The building of a high-speed train will convert Ayutthaya into a logistic hub of the region. Ayutthaya will see influx of goods, labor, investment, and other economic activities. This is equipped the town with an ability to increase its agriculture productivity. Cheap agriculture products can be import from the neighboring countries and to be manufactured, processed, and value-added with more material variety. Ayutthaya is one of the 8 cities in the lower Chao Phraya Flood Plain, which are facing development challenge and water management. If flood plain become water detention network and harvest ‘Natural Capital’, not only the entire flood plain will benefit from better management of water, but also apprising the area value both economically and culturally.